We pride ourselves in the fact that our students are offered the opportunity to participate and compete in a wide range of sporting activities. This totals 13 different sporting activities at County, Munster and All-Ireland levels in a range of age categories. There are also a variety of clubs on offer for students to participate including Camera Club and Club Gaeilge. For any further information regarding Sport in Kinsale Community School please contact Ms. Marie Hayes. The Choir and the Trad Group rehearse regularly. Rehearsals for our annual school musical takes place every week for a number of months leading up to the show. 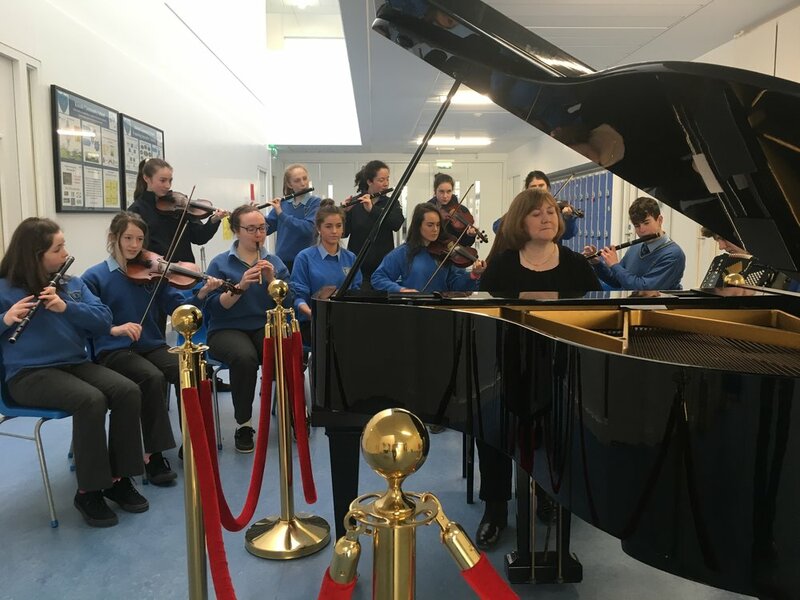 The school facilitates a variety of different music related events throughout the academic year which are very popular with the students. These include performances at the school mass, mass for the aged, opening evening and awards night. Students also enjoy performing for many celebrities who visit our school. These regular activities have proven to be of huge benefit to students both academically and culturally. School musicals are run regularly in collaboration between the Art and the Music department, and with the local community, parents etc. The Art department design and paint the sets and props for these shows. Most of this work is extra–curricular and done outside of class time with the help of pupils who volunteer their spare time. Last December a homage to Hairspray was shown, with a bright, 60’s themed, colourful set. Junk Kouture is a national contest which encourages young designers in second level education to create striking couture designs and impressive works of wearable art from everyday junk that would normally find its way into the bin. This is timetabled once a week for a double in Transition Year. This year various materials have been used from leaves, coffee pods, playing cards and newspaper. The students worked on their designs after school with the help of Ms. Kelly. The Camera Club is back in action this school year and has been busy shooting some wonderful shots this term and will be on display in the coming weeks. It is a wonderful opportunity to show creativeness and skills. The Camera Club meets every Thursday at lunch time in E03 under the guidance of Mr. Diarmuid O’Donovan. The door is always open and new members are always welcome! Our First year players start the camogie year off by competing in the Cork Colleges Blitz. The league commences later in the school year. This year our girls are competing in the B League after successfully winning last year’s league. The Munster competition advances to All Ireland level and we were successful to be crowned All Ireland Champions in 2012. Following on from this success we have been fortune that every passing school year is a successful one for our camogie teams. The school enters a team each year in the Interschool Hunter Trials and this team competes regularly throughout the year in Interschool Showjumping Events. Boys Basketball is also competed at 4 different age categories - 1st year, 2nd year, U16 and U19, in the Cork Schoolboys Basketball league. An All-Ireland qualifying series and All-Ireland finals are the progressions from these Cork leagues. Teams at U14, U15, U16 and U18½ age groups are entered in the Cork and Munster Post-Primary Schools Football Competitions. The tradition of Gaelic football in surrounding clubs is fostered and developed within the school. The School team participates in Cork Schools Matchplay and Strokeplay and Munster Matchplay and Strokeplay competitions. Teams at U14, U15, U16 and U18½ age groups are entered in the Cork and Munster Post-Primary Schools Hurling Competitions. The tradition of Hurling in surrounding clubs is fostered and developed within the school. Since 2014 we compete in the Munster Post Primary Schools competition at Senior level and at Junior level we compete in the Cork Post Primary Schools competition. In 2016 a new competition was established for 1st year girls in which we made it to the knock out stages. At Senior level in Munster we are currently graded C, and have a good record in making it to the semi-finals of this competition since its inception, but the elusive championship win still awaits. The standard in Munster is higher than that within the county, naturally, but given the success of the Kinsale Junior & U21 ladies teams in 2016 and 2017, hopefully the wait will not be a long one. At Junior level in Cork we compete in the B grade and have won County titles in 2017, 2015 and 2014 at this level. The first year competition is graded according to the number of girls in the school and this made it challenging for us in 2016 as on paper we have a big number of girls, but given the many sports on offer in Kinsale Community School, not all of those interested in playing sport choose football. Despite this, the girls gave a good account of themselves and hopefully they will continue to play ladies football and girls from different clubs will gel together and continue to represent KCS proudly over the next number of years. Prior to 2014 we had unprecedented success in the Cork Vocational Schools competition and worked our way up from the 'C' grade at Senior level to competing in the 'A' grade at all levels in the latter years of this competition. Restructuring of ladies football in Cork saw the end of this competition in 2013. One of the stand out players during this time was Orla Finn, who is now a well established player on the Cork Senior Ladies football team and a household name. We wish her continued success at club and county level. We are always very proud of our students who are selected to represent Cork on the intercounty scene, and there have been many down throughout the years. On occasion students have also been selected on the Munster Post Primary Schools team which competes at Senior cycle only. Munster PPS – Georgia Gould, Tracy McCarthy, Sadhbh O’ Leary. Cork Minors – Georgia Gould, Jenny Murphy, Fiona Keating. Cork U16’s – Faye Ahern, Ellen Maguire, Siobhan O'Donovan. Cork U14's - Geraldine Tyner, Ava Mulhall. A Senior Girls team represents the school in the Cork Senior Schoolgirls league and Cup and the Munster Schoolgirls Soccer Cup. A 1st year Boys team, U14, U16 & Senior Boys team enter the Cork Schoolboys Cup and Munster Schoolboys Cup each year. Students of Kinsale Community School participate in the Munster Track & Field Championships each February in Nenagh. Qualifiers from these Championships then compete in the All-Ireland Track & Field Championships. The school works in conjunction with students' parents to ensure students have the opportunity to participate in these competitions. This working collaboration between parents and staff shows the school working together as a whole community. Gaelbhratach is a reward-based scheme which officially recognises schools which are active in the promotion of Irish throughout the school. Gael-Linn is in charge of the Gaelbhratach in the schools in partnership with Conradh na Gaeilge at second level. It is a highly prestigious achievement and we are delighted to have been awarded our first Gaelbhratach in 2017. What is the aim of Gaelbhratach? The aim of this scheme is to encourage and enable schools to promote Irish in a planned, ongoing, enjoyable way. To gain recognition from the community in which the school is situated of the school’s commitment to the promotion of Irish. Promotes all aspects of physical fitness including nutrition and wellbeing in Kinsale Community School! With junior and senior training sessions for students of all abilities. Fitness club is fun way to exercise whether you like team sports or not. It’s structured in the following way: mobility with some nutrition facts, strength and conditioning and finishes with a HIIT session.